I was blessed to have a few moments with the Dali Lama at the 4th World Summit of Nobel Peace Laureates in Rome, Italy. We spoke briefly about the Honor Project/Peace Village Sanctuary and our contribution to a more peaceful world. 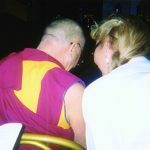 Since I believe child abuse is the root of violence, I shared with the Dali Lama that if we want to cultivate a “Culture of Peace” we have to create, and begin to educate a “Language of Peace”. In order to do this, we have to understand the language and culture of child abuse. We can cultivate a Culture of Peace if we are WILLING to make PEACE a PRIORITY.